Internet TV Growing like a Rocket | TvStartup Inc.
Internet TV Is taking off like a rocket! There's no stopping it and for some that means big profits! 10 Years ago the thought of internet TV overtaking satellite and cable combined was a far fetched idea; Today its is reality. 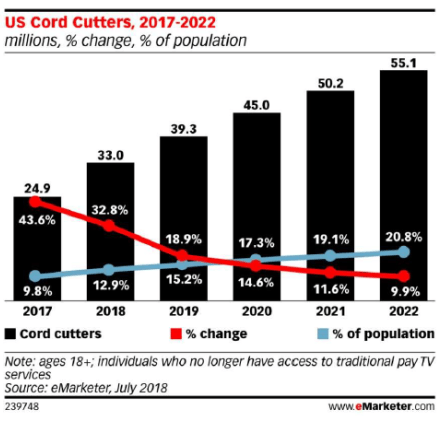 The industry calls it “Cord cutting” - that is when a cable or satellite subscriber decides they no longer want to pay the monthly fees associated with their cable subscription. rtune.com). Stocks for major TV providers have also taken a nose dive. The news may be bleak for Pay-TV services but for streaming services times couldn't be better. Netflix, Hulu and many smaller internet based streaming services have seen incredible gains. In fact millions of Americans have already scrapped and pulled the plug on cable TV making it look as if it is a mass exodus. In 2018 more than 33 million Americans are now considered chord cutters. This is a huge revenue loss for cable and satellite TV. 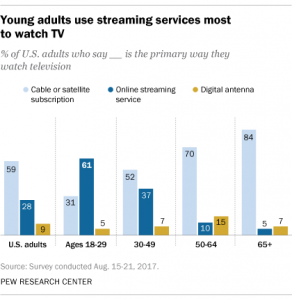 In fact the trend is even stronger among young adults as 6 in 10 young adults use online streaming as their primary way to watch and consume television (as of 2017). For years many believed that live sports would prevent many subscribers from canceling their cable subscription, but this has proven false. Now with ESPN and other sports services online there is little to hold subscribers loyalties. What does this mean? This means the power now lays with those that can create content. No longer do large corporations dictate what the masses will watch. Anyone with a creative mind, a camera, and their own online TV network can compete with the big boys. As the cable market crumbles there will be small business and video entrepreneurs to pick up the pieces and build profitable streaming models. Here's the big picture, when you have a mass decline in one area of a business then it is only logical you will have a large increase in another. In other words the undoing of the cable and satellite industry is a HUGE potential for those that can capitalize on it NOW. Today is more like the wild west of Internet TV and when the dust settles those that fought for viewership will be the next leaders in content and viewership. In fact Internet TV also called OTT is expected to climb to a 30.6 Billion dollar revenue by 2022 (study done by PricewaterhouseCoopers ). Internationally similar growth is expected as high speed internet becomes more available in developing countries. Overall internet TV is one of the fastest growing segments on the planet and making an investment into Internet TV is not only a wise decision but a logical one. More and more baby boomers are following in the foot steps of millennial's and transitioning to a subscription video service via the internet. And to be fair there are more viewers than the statistics show; that's because most stats don't account for shared accounts. In the past older adults might of watched one or two of these video services occasionally with a friend or relative, but today its becoming a part of their ruglar entertainment diets" said Chris Bendsten, senior forecasting analyst at eMarketer. With more than 250 million smart TVs sold monthly around the world, and connected TV devices (With just Roku and Firetv alone accounting for more than 90 million viewers) its becoming easier to watch both live TV and on demand video. The online video landscape is growing as a whole because of the availability of so much original content from an array of producers who in times past would not of had the opportunity to distribute their original video content. 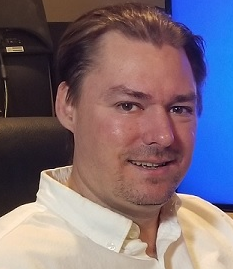 "Consumers don’t seem to be price sensitive to adding multiple services because they don’t want to be the only one in their family or friends group that hasn’t seen the latest hit original show, now matter which platform it’s on," Bendtsen said. Overall you have more younger and older adults tuning in to internet TV with the newer generation almost completely detached from cable, You have a crumbling infrastructure of traditional cable and satellite TV operators, and a growing revenue for internet TV operators. All of these factors blowing in the wind only SPELLS one thing for content creators; OPPORTUNITY. Create a Roku Channel – How much does it cost and how do you do you create it?